A line of vacuum pump inlet traps that are designed to protect vacuum pumps used in Atomic Layer Deposition (ALD) processes in research and production environments is available from MV Products of No. Billerica, Massachusetts. MV Vacuum Inlet Traps for ALD Processes are designed to prolong vacuum pump life and reduce service intervals by removing large solids and volatile precursors from the vacuum stream. Featuring stainless steel construction and multiple plumbing options, two models are offered: the MV Multi-Trap® for production use that is capable of up to 2,500 IN3 of solids accumulation and the PosiTrap® for smaller research and development applications. 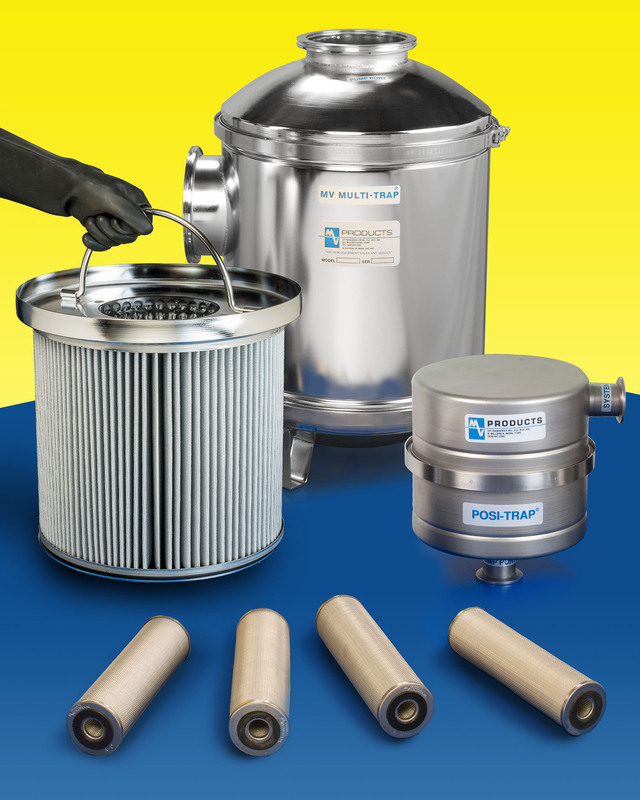 Utilizing replaceable filter elements, MV Vacuum Inlet Traps for ALD Processes can be equipped with stainless steel gauze, micron-rated polypro-pylene, activated alumina or charcoal, Sodasorb®, and other types to remove residual solvent vapor acids and particulates. The MV Multi-Trap® includes a knock-down stage and can be configured with up to six stages of filters or a single large 13” H x 14” dia. pleated high-temp. polyester filter. MV Vacuum Inlet Traps for ALD Processes are priced depending upon size and configuration. Price quotations are available upon request.